Challenge yourself or get lost with a team of friends and family — it's the worlds largest interactive game! We all know the sweet taste of summer corn on the cob. 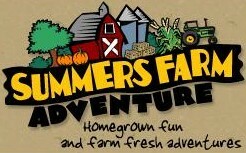 At Summers Farm Adventure, we're offering a sweet time for all ages — 14 acres of pure fun getting lost in rows of tall corn stalks. The maze is divided into phases that will accommodate all age groups. Visitors to the maze at Summers Farm Adventure choose the smaller maze for the younger crowd or our super challenging larger maze. You might be fortunate enough to stumble onto the correct pathway, (and answer the questions correctly) conquering our 14-acre maze in less than 30 minutes. Or you might find yourself a bit directionally challenged and take a couple of hours to make your way through the corn puzzle. Moonlight Maze! Increase the challenge! Explore the maze by flashlight, if you dare! Bring your own flashlights or purchase them at the farm. Looking for some good Halloween fun in Maryland? Kent Fort Farm's Pumpkin Patch is the place to be! We have everything you need to get in the Halloween spirit! Everybody has fun here - it's impossible not to! Bring the family and the kids to Kent Fort Farm's Pumpkin Patch for some classic Halloween fun! Pick your favorite pumpkin at our pumpkin patch, enjoy the festive hay ride, and visit the animals at the petting zoo! We offer a safe and fun Halloween environment for all ages! We offer a wide variety of activities for you to do during the month of October. Come visit us to take great autumn pictures of your kids as they pick out that perfect pumpkin. We are the best around! Find the best Halloween attractions in Maryland, pick your own pumpkin patches in Maryland, corn mazes in Maryland, Halloween hayrides in Maryland, and Halloween events that include attractions like face painting, face painting, pony rides, inflatables, Halloween hayrides, and places you can go and pick your own pumpkins in Maryland. Each Halloween hundreds of Halloween events for kids open each year in Maryland. Do you want to pick your own pumpkins and bring the kids where Maryland pumpkin patches includes other events like hayrides, corn mazes and more? Halloween Attractions helps you find simply the best and spookiest Halloween family fun in the state of Maryland. Farmers across Maryland have turned their family farm into massive Halloween events where guests are allowed to pick their own pumpkins, corn stalks, while having a fun Halloween Experience inside one of Maryland's biggest and best Halloween Attractions. Corn Mazes have become a staple attraction inside these mega Halloween Attractions in Maryland where farmers create detailed patterns in a corn field and guests must find their way through the maze of corn. Additionally one of the new traditions inside these Pick Your Own Pumpkin Patches in Maryland is the hayride where guests board a wagon and farmers pull you around spooky sets. Halloween Attractions in Maryland are huge over the top Halloween Family Fun for everyone no matter if you are looking for a Maryland Corn Maze, or Halloween PIck Your Own Pumpkin Patch in Maryland www.HalloweenAttraction.com is the single best source to find everything Halloween this October we want to help you locate all the best halloween events in and around the Baltimore, Frederick, Gaithersburg, Bowie, Annapolis, Bel Air South and Cambridge, Maryland, areas. If you are looking to find the best Halloween events and more, find everything you need at www.HalloweenAttractions.com. Some Halloween Attractions in Maryland will feature a haunted house for kids in Maryland and or simply a haunted house. Many of these Halloween Attractions in Maryland will run daytime family oriented Halloween Attractions during the daytime and haunted houses at nightime. Make sure you check their website to find out of the daytime events are different than nightime events just in case you have young children. Haunted Houses in Maryland on family farms are simply put another way for farmers to earn additional revenue which in turn helps keep the family farm from going under. Try to support your family farmers and visit their Halloween Attractions instead of taking the easy way out and visiting some mega retail store to purchase your pumpkins. Grab your family video camera and head out to a Halloween Corn Maze in Maryland, and get out there and pick your own pumpkins in Maryland.